You’ve heard it a lot lately. 97% of climate scientists believe that climate change (aka global warming) is happening, and human activity is mostly to blame. It doesn’t matter that this figure comes from a terribly flawed study. It’s a great soundbite, so it is used a lot. Consider, for example, the president of the Sierra Club, which calls itself “the nation’s largest and most influential grassroots environmental organization.” In a recent testimony, he didn’t even know about the dramatic disagreement between the satellite temperature record and the global climate models that have been used to support global warming hysteria. Instead, he simply kept repeating the claim that 97% of scientists believe that global warming is mostly caused by human activity. Now, of course, anyone who has been reading this blog for a while knows that the opinion of a group of people (even a large majority of scientists) means very little to me. If I am going to believe in something, I want the objective data to support what I believe. Opinions are not objective data, so I try to look at the evidence and think for myself. Unfortunately, there are a lot of people who don’t want to think for themselves. Like the president of the Sierra Club, they simply believe whatever the majority of scientists say. Well, a recent survey of the American Meteorological Society might be of interest to such people. Founded in 1919, the American Meteorological Society (AMS) is the nation’s premier scientific and professional organization promoting and disseminating information about the atmospheric, oceanic, hydrologic sciences. They surveyed their membership about climate change, and 4,092 of the members responded. This represents a 53.5% response rate. Not surprisingly, there was no 97% consensus to be found among the respondents. The only number that came close was the answer to the question, “Regardless of the cause, do you think climate change is happening?” 96% of the respondents said yes, while 1% said no, and 3% said they didn’t know. Of course, since that question included the possibility that climate change is completely due to natural processes, this result tells us very little. In the end, 67% of the membership believes that climate change is caused more by human activity than by natural processes. Another 14% think that human activity and natural processes are pretty much equally to blame for climate change. Even adding those to the previously-mentioned 67%, however, gets us to only 81%. An additional 7% said that climate change is mostly due to natural factors, while 5% said that climate change is totally due to natural factors. Another 6% gave the answer that is supported by the currently-known data: “I don’t know.” As noted above, the remaining 1% think climate change is not happening. More than 90% of the respondents had degrees in a science-related field, and a more than 60% had either a masters or a Ph.D. in a climate-related discipline. Thus, this is a fairly good sample of people who are interested in climate science and are reasonably knowledgeable about the issues related to climate change. Based on my reading of the scientific literature and my discussions with those who are experts in climate science, the results of this survey do a pretty good job of reflecting the views of the climate community as a whole. Yes, a majority of climate scientists do think that climate change is mostly due to human activity. However, there is a sizeable minority that thinks natural processes have a lot to do with it, or that there simply is too much uncertainty in the data to give a definitive answer for what is causing climate change. While the “97% consensus” meme makes for a very good political ad, it simply isn’t correct, and anyone who uses it isn’t really interested in understanding climate change. Well written and researched article! Of course there is “climate change” as there has been since the days of Noah. How else would we have “weather”? All atmospheric changes (fronts, storms, droughts, floods, etc.) are cause by changes. Some of these changes are smaller but many are larger climactic fluctuations that rise and fall over great spans of years. It is folly to think that we, as humans are so powerful as to dominate Earth’s atmosphere. Do we add to the causes of change? Probably, but not nearly to the extent that activists believe. Consider that one moderate volcanic eruption can pump as high a volume of noxious gases into the environment as a decade of automobile traffic and you see the fallacy of the “human cause” argument. We are called to be stewards of the planet, not slaves to it! Thank you for being a scholarly voice of reason in this debate. Me? I’m just an engineer with a smattering of common sense. God bless you! Good stuff, Jay. I think you made some valid conclusions that correctly dispute the false statistic that you set out to challenge. Couldn’t we also make two other conclusions? For #1, just as you generously rounded up to 81% the portion of those who believe humans influence climate change, couldn’t you also argue the opposite that at least 33% believe humans are not exclusively responsible for climate change? And #2 (and similar to Don’s comment), the question about believing that “climate change is happening” is extremely vague. Wouldn’t it be better for environmentalists pushing global warming to be more specific about the degree of climate change (e.g., changing at an accelerated rate of X% in the last Y years)? Or do you think they purposely want ambiguity to disguise their lack of data? Actually, you could argue that at least 71% of the AMS members believe that humans are not exclusively responsible for climate change. Remember, only 29% said that humans are 81%-100% responsible for climate change. 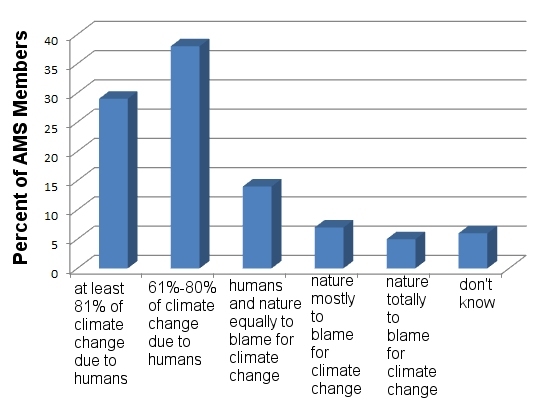 The rest of the 67% say that human are responsible for 80% of climate change at most. I am not sure that those who are pushing human-made climate change are “purposely” ambiguous. I think that based on the observable data that exists now, we have no idea whether climate change is completely natural, completely human-made, or somewhere in between. Thus, people who want to take a position (despite the lack of observable evidence) tend to choose whichever one fits their preconceived notions (or financial position). If you land on the idea that humans are completely or mostly to blame, you can’t be any more specific about how much climate change they are causing. The data for such a judgement simply don’t exist. There seems to be some debate about that 97% number. Much of the problem arises when this number is said to say something that it does not. The study’s authors [Cook et. al., 2013 “Quantifying the consensus on anthropogenic global warming in the scientific literature”] did not claim that 97% of all scientists form a consensus. They claimed that 97% of the papers they surveyed constitute this consensus. The presumption here is that the experts in the field are the scientists who are actually publishing peer-reviewed papers on climate change (and not on everything else). Here is a discussion of the nuances of this: Yes, there is a strong consensus on climate change. The article you cite by Richard Tol is addressed in turn by the authors Cook et.al. here and here. You are correct in stating that a survey of scientists would yield a majority who affirm that climate change is attributable to human activity but not a number close to 97%. The AMS article you cite is certainly indicative of this. But this is missing the point. If you survey the general population, you will surely not get anywhere close to 97% either. We can, however, probably agree that the general population is not an expert on climate. Importantly, neither are the majority of the members of the AMS. A meteorologist is not a climatologist. A meteorologist is the weatherman on your local news who often wrongly predicts whether it will rain tomorrow or next week. Meteorological models are notoriously unreliable over the long term because too many variables come into play. This automatically makes meteorologists suspicious of any model that attempts to predict phenomena over a long period of time. Climatologists, on the other hand, study trends over thousands and millions of years. The data set is not the same and neither are the models. Comparing meteorologists to climatologists is like comparing an automobile mechanic to a city planner working on traffic patterns—their work may involve automobiles and even overlap in some areas, but the focus and the models employed are different. More pertinent to this discussion is that the areas of expertise are different. Though it is possible for a meteorologist to be a climatologist as well, this is not often the case. The two terms are not interchangeable and should not be conflated. This article examines the differences: How do meteorologists fit into the 97% global warming consensus?. Thanks for your reply, Benjamin. Unfortunately, you seem to have been taken in by those who want to promote the fundamentally-flawed Cook et. al. study. I will try to help you see how unreliable it is. In your first link, the author claims that the findings of the study are robust because of the large sample size, but as Tol points out, that sample was drawn from a database that is predisposed to support the human-made climate change agenda. The author of the article tries to brush that very important criticism aside by claiming that smaller journals produce lower-quality papers. However, if the review was as robust as the author claims, that shouldn’t matter. Those reviewers should have been able to separate out the lower-quality studies. The fact is that when you reject certain sources, you are biasing your results, plain and simple. Such biases are anti-science and don’t belong in any serious study. Also, I would point out that you claim Cook et. al. have replied to the article I linked. However, that’s definitely not the case. The link you gave was published a FULL YEAR BEFORE the link I gave was published. The fact is that the Tol article I linked points out fundamental flaws that show the conclusions of the Cook et. al. paper are completely invalid. For example, he shows that when you review the time stamps on the analyses (which Cook originally claimed weren’t kept), you find that one reviewer rated 675 abstracts in a 72-hour period. If the reviewer stayed up for the entire 72-hour period and did nothing but read the abstracts, he or she spent only 6.4 minutes per abstract. That’s hardly a legitimate analysis. There are many more issues, including data collection that occurred after the analysis, which would bias the results even further. The study is clearly fundamentally flawed and should never be used in any legitimate discussion of the science of climate change. Of course, your main point is a straw man that is used whenever it becomes clear that there is no real scientific consensus on climate change. You claim that the AMS survey can’t be used to determine whether or not there is a consensus because meteorologists aren’t climatologists, and therefore they aren’t experts in the field. However, had you actually looked at the study, you would have found that the majority of the people who responded to the survey were not “the weatherman on your local news who often wrongly predicts whether it will rain tomorrow or next week.” As I stated in the article, 60% of the respondents had either a masters or a Ph.D. in a climate-related discipline. Thus, there were several experts in the mix. Also, it is my contention that if you limit your sample to climatologists, you would probably find an even SMALLER majority supporting the idea that humans are mostly to blame for climate change. When you look at leading climatologists like Dr. Patrick Michaels, Dr. Judith Curry, Dr. Timothy Ball, Dr. Nir Shaviv, Dr. Tim Patterson, etc., etc., you find a strong cadre of experts who are deeply skeptical of the idea that people are largely responsible for climate change. This list doesn’t even touch on the many other experts who are skeptical of human-induced climate change hysteria, like Dr. Richard Lindzen, who is an atmospheric physicist. Of course, the real nonsense you are promoting is the idea that non-climate scientists can’t understand climatology well enough to make an informed decision regarding climate change. Of course that is absurd. We can read the scientific papers, compare the data to the projections, etc. That’s one of the main points behind studying science. Sure, you have a speciality, but you are also well-versed in the scientific method, scientific terminology, scientific reasoning, etc. As a result, you can evaluate evidence from a broad range of scientific endeavors. Indeed, while I rarely put much faith in the scientific opinions of others, I tend to take non-specialists more seriously, as they are typically not biased by funding, worn-out paradigms, etc. etc. As a result, a non-specialist is often better equipped to provide an unbiased analysis than is a specialist. Indeed, when I was actively doing nuclear chemistry research, I found that the best input I got on my research came from scientists who were not nuclear chemists. It often takes experts to PRODUCE the data, but non-experts can evaluate that data, and sometimes they do so better than the experts. It’s been a busy week for me. I marvel at how you manage to keep up with your blog on top of everything else you must have going on. So, thank you for your time. You replied with a few paragraphs so I will comment on these numerically. 1. I don’t disagree with you that the Cook et. al. paper has its flaws and neither does the author of the link I cited. But let’s not make that paper say something which it does not. The study’s authors specifically state that they surveyed papers generated from an ISI search of peer-reviewed literature, climate-related (key words ‘global climate change’ or ‘global warming’), and including an abstract. a) They excluded 186 papers that were not peer-reviewed. Why these papers were not peer-reviewed and how they got into the literature is unclear. Maybe they were opinion pieces in some of the journals. This automatically excludes non peer-reviewed literature such as articles in a newspaper, letters to the editor, blogs, and comments to articles such as what I am doing here. b) They excluded 288 papers that were not climate-related. If you are doing a survey about climate change, why would you include a paper that does not address climate? c) They excluded 47 papers without an abstract. If you are going to survey 12,465 papers, reading the abstract is a quicker way to do this. This may leave out some papers because the abstract is not a perfect description of the paper itself. This is something that could be improved in the study, perhaps, but 47 papers out of about 12,000 will not change the results much even assuming that they all happened to be against the final tally. The point is that the rejected papers were not excluded because they disagreed with some premise but because they did not fit the methodology of the study. How many of the scientists in the AMS survey of your article were among the published papers in the Cook et. al. study? Probably not a lot. But they were not excluded because of their opinion but because they had not published in the venue being surveyed. The definition of “working scientist” is “publishing in the peer-reviewed journals.” The current attacks by Tol on Conway et. al. and vice versa is part of the peer-review process. This will eventually get sorted out, not by opinion pieces, but by the editors and the scientists who are publishing in these journals. As to the charge about leaving out papers published in lower quality journals, the author of this article posts on his opinion here (#6). Is the charge a valid one? Perhaps. But your assertion that the researchers could have weeded out the lower quality papers implies that they would have had to read through the articles in question—something that they were trying to avoid by reviewing only articles with abstracts (itself a problem, see above). By concentrating on “higher quality” journals they would automatically be taking advantage of the more stringent review process in place. But back to your post. We are comparing apples to oranges. The problem arises when we take that number of 97% (of the papers selected from a specific publishing list) and equate that with “all climate scientists” and even “all scientists.” The problem is not with Cook et. al. but with the reporting agencies who have conflated the two. Your post is technically correct because it disputes the erroneous position of the popular media’s interpretation of “97% of all scientists,” but I would clarify that this should not extend to the original article by Cook et. al., because that is not what they claim. Whether the article itself has scientific merit is a separate debate. Your phrase “the human-made climate change agenda” implies a conspiracy of sorts. These charges of a conspiracy are fomented by both sides of the issue. On the one hand, climate-change deniers assert that support for the issue stems from some vast government conspiracy that forces researchers to stick with the status quo or lose their funding. This conspiracy would presuppose a GLOBAL conspiracy as climatologists are not confined to citizenship of the United States. A more benign version of the theory would assert that climatologists are so entrenched in their thinking that they actively suppress any challenge. This is more likely, though I would change the word “suppress.” If we change “suppress” to “dispute,” then we can say that there is precedence for this entrenchment, as witness the slow acceptance of continental drift. On the other hand, the scientific establishment asserts that there is a conspiracy funded in great part by the fossil-fuel industry and like-minded groups that actively attempt to discredit ongoing science, particularly in the political arena. This conspiracy does not care about the science but about the money that will be affected by policy change. There is good evidence supporting the existence of this conspiracy as researched recently in the book by Oreskes & Conway. So which is more likely: an international conspiracy suppressing a dissident viewpoint because it does not agree with current policy, or an industry conspiracy suppressing a dissident viewpoint that will affect their bottom line? When the funding sources of some of these adversarial scientists is revealed (see #4 below) that second conspiracy theory becomes a lot more intriguing. 2. Amazing! Cook et. al. replied to Tol a full year before he published his article. They must be prescient! My apologies there, I’m being facetious. I should have been more specific. The reply by Cook et. al. [http://www.skepticalscience.com/docs/Cook_2014_Reply_Tol.pdf] is to the original article by Tol [https://www.heartland.org/sites/default/files/cook_consensus.pdf]. The link you provide is a later blog post by Tol. You can see the full timeline here. Here is another response to some of Tol’s charges and here is a response to Tol’s “rater fatigue” issue that you mention. 3. I don’t think we have a disagreement about consensus. Your AMS survey places this at 67%. Two-thirds is a significant majority. What we disagree is about the extent of consensus and how it was obtained. Your gripe is not necessarily with the Cook et. al. survey but with the reporters who took the “97% consensus among published papers” and conflated that to “97% consensus among scientists,” as mentioned above. I wish you would be more specific in what you mean by “a masters or a PH.D. in a climate-related discipline.” “Climate-related” is rather vague. I can say that a registered nurse has a degree in a “medically-related discipline” but that does not make him/her a doctor. To be clear, I am not denigrating the qualifications or the intelligence of meteorologists; I am simply saying that the area of expertise is not the same. Certainly they are welcome to author and submit a paper to any of the journals that Cook et. al. surveyed. Their failure to do so does not constitute a requirement on the part of Cook et. al. to include their dissenting opinion into the survey. 4. I am somewhat skeptical of some of the “leading climatologists” you mention. Half of them are linked to the fossil fuel industry which tends to frame their viewpoints with the appearance of bias. a)	Dr. Patrick Michaels has admitted that almost half of his funding comes from the oil industry. ABC News ran a story wherein Intermountain Rural Electric Association (Colorado) admits that it paid Michaels $100,000. The Seattle Times revealed that Michaels was paid $160,000 from the fuel industry. $160,000 buys a lot of bias. b)	Dr. Judith Curry has taken money off and on from the oil industry but denies bias and appears to be more of the “let’s wait until more evidence is in before we commit” persuasion. That’s generally a sensible position to take. d)	Dr. Nir Shaviv is an astrophysicist whose claim to climatology is his proposal that global warming is caused by solar activity. Thus far he has failed to convince climatologists and his paper is disputed here. e)	Dr. Timothy Patterson is a geologist who describes himself as a “paleoclimatologist.” He has a very respectable number of peer-reviewed publications but is tainted with ties to oil-industry money. f)	Dr. Richard Lindzen has good credentials but he, too, is shadowed by his ties to oil money. To be clear, a funding source does not in itself disqualify the merit of a publication. But when the slant of a paper and the agenda of a funding source happen to coincide so neatly, one tends to look askance at the conclusions that are drawn. 5. I am NOT promoting the nonsensical idea that non-climate scientists cannot understand climatology. I did say that a meteorologist could be a climatologist but that this is not always the case and that the two fields should not be equated. The AMS defines a meteorologist as a person who “uses scientific principles to explain, understand, observe, or forecast the earth’s atmospheric phenomena and/or how the atmosphere the earth and life on the planet.” Climatology is the “study of the myriad factors that influence weather, and the influence of weather on the environment…over the course of time…” The main difference is in the timescales involved. A climatologist is more likely to have studied geology, for example, in order to understand the weather patterns over the decades, centuries, or millennia. 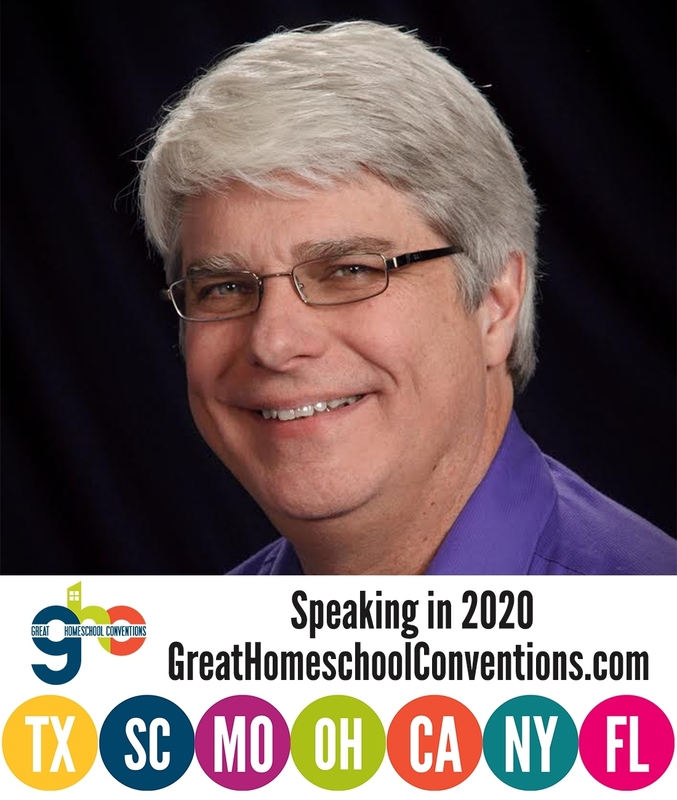 A geologist like Dr. Timothy Patterson can thus bring his particular area of expertise to bear on these matters and publish in the field (as he has done). I am not disputing his credentials in climatology, only his objectivity. Were any of the leading climatologists you mention left out of the 97% tally? I don’t know. Dr. Patterson, in particular, could have been included in the Cook et. al. survey since he is a prolific enough author. Dr. Ball has not been publishing in peer-reviewed journals lately and Dr. Shaviv has published in astrophysics but not in climatology so far as I can tell. But is it the fault of the Cook et. al. study that they have not published in peer-reviewed journals? Should Cook et. al. be required to canvas every single publication for their survey? Where do they draw the line? Thanks for your reply, Benjamin. It’s really not all that hard to reply to falsehoods, as long as you have been studying the literature. Since most of what you wrote in your previous reply was demonstrably false, it wasn’t hard to reply to. The same can be said of this reply. 1. The Cook et. al. paper is, indeed, flawed. I am glad that you admit that. However, you seem to think that it is not fatally flawed, and that is demonstrably false. The paper is fatally flawed and has no business in any serious discussion of climate change. The problem is not the papers that were rejected. It is the papers that were even considered to be included. By limiting its search to a specific set of journals, the study biased itself to papers that were more likely to promote the human-induced-climate-change agenda (and yes, it is an agenda, whether you want to admit it or not). If a study wants to gauge what climate research is showing, it needs to include an unbiased sample of climate-change-related papers. The study did not, so immediately, we know it is fatally flawed. I wholeheartedly agree that the definition of a working scientist is someone who publishes in the peer-reviewed literature. You actually contradict yourself on that point later on (as you will see), so you don’t really seem to believe that when it is inconvenient for you. However, there is a LOT of peer-reviewed literature that wasn’t even considered in the fatally-flawed Cook et. al. paper. Once again, that makes it clear it doesn’t represent a study of what is going on in climate science. Your comment on “higher quality” journals is demonstrably false. A “higher quality” journal doesn’t necessarily have “more stringent review.” In fact good peer review in “higher quality” journals is often sacrificed to support a specific agenda. Consider, for example, Dr. Dan Shechtman. He tried to submit his excellent research on quasicrystals to the “higher quality” journals. However, because they promoted the agenda that quasicrystals can’t exist, they did not publish his article. Instead, he had to submit it to a “lower quality” journal in order for it to be properly peer reviewed. He eventually received a Noble prize for the work published in that “lower quality” journal, because its peer review was superior to that of the “higher quality” journals, because it was not blinded by the anti-quasicrystal agenda. Once again, when you arbitrarily exclude research, you are not surveying the research that is being done and, as a result, you are not promoting serious science. You claim, “The problem is not with Cook et. al. but with the reporting agencies who have conflated the two.” That, once again, is false. Certainly, the reporting agencies are not characterizing the paper properly, but that’s nothing new. However, even if the reporting agencies got the actual conclusion of the Cook et. al paper correct, that wouldn’t help. Since the paper itself is fatally flawed, the paper itself is the problem. My reference to “the human-induced-climate-change agenda” is not a conspiracy reference. It is simply a statement of fact. Science is mostly driven by agendas. Dr. Shechtman’s work on quaiscrystals was rejected by “higher quality” journals because of an anti-quasicrystal agenda. It wasn’t any kind of conspiracy. It was just the agenda that occurs when things people are taught to be “scientific facts” are believed more than the data. That’s an agenda, and it appears throughout science, not just in climate change. In fact, you are the one promoting a conspiracy theory. You use ad hominem attacks on climatologists who disagree with your perspective, claiming that they are “tainted” by energy industry money. The fact is that there is a lot of money on both sides of the climate debate. Those who agree with the human-made-climate-change agenda are benefiting from an enormous amount of money in salaries and research grants, as are those on the other side. By claiming that one side’s money is more likely to promote an agenda than the other side’s money, you are the one who becomes a conspiracy theorist. 2. I agree that the article you posted was a reply by Cook et. al. to an article by Tol. However, it was not a reply to the article that I linked. That’s the point. The fact is, Cook et. al. have not replied to the article I linked in any satisfactory way. Once again, NEITHER of the further articles you link respond to the article I linked, because they were published before the article I linked. Now, I do agree that Cook et. al. desperately tried to respond to the rater fatigue argument, but they could not. In addition, they did not respond to the specifics. Indeed, there is no satisfactory response to the issue I brought up: hundreds of abstracts “reviewed” in an absurdly short time window. This, once again, shows that the review is not scientific in any way, which is yet another indicator of how fatally-flawed the Cook et. al. paper is. 3. You claim, “Your gripe is not necessarily with the Cook et. al. survey but with the reporters who took the ‘97% consensus among published papers. '” Once again, that is false. As I have indicated, the Cook et. al. is fatally flawed and has no place in any serious discussion of climate science. You further claim, “Two-thirds is a significant majority.” That is certainly true, but it is not a consensus. The definition of a consensus is “a ​generally ​accepted ​opinion; ​wide ​agreement.” 67% doesn’t indicate a consensus. Even 80% doesn’t indicate a consensus. A consensus must be general agreement, and the climate community is not in general agreement about human-induced climate change. There is an enormous amount of controversy about it, as indicated by the AMS survey. You say, “I wish you would be more specific in what you mean by ‘a masters or a PH.D. [sic] in a climate-related discipline. '” You don’t have to wish anything. As I stated in my previous reply, all you have to do is actually read the survey, which is helpfully linked in the original article. The 60% I mentioned have a Masters or Ph.D. in meteorology or atmospheric science. Are you claiming that neither of those are climate related? I surely hope not! 4. This, of course, is where you launch into ad hominem attacks on world-renowned climatologists, presumably because you don’t like their views on climate change. That’s unfortunate, but not surprisingly. Let’s go through each of your ad hominem attacks so that my readers are not influenced by your libelous allegations. a) You show that Dr. Patrick Michaels has received money from oil companies and then claim, “160,000 buys a lot of bias.” However, you neglect to tell my readers that Dr. Michael Mann has received more than 6 million dollars in research grants to do his climate research. I bet $6,000,000 buys a lot more bias than $160,000. As I said before, there is big money on both sides of the climate debate, and only a conspiracy theorist would claim that the money on one side influences the debate while the money on the other side does not! b) You claim that Dr. Judith Curry “has taken money off and on from the oil industry but denies bias.” You fail to point out, however, that when she DID get oil money, she was a strong supporter of the human-made-climate-change agenda. It was long after she took money from the oil industry that she actually started looking seriously at the data and realized that the human-made-climate-change agenda is not defensible with the data we currently have. c) You claim that Dr. Timothy Ball has published only four peer-reviewed articles on climate change, the last one being in 1986. Once again, demonstrably false. He has written several peer-reviewed articles on climate change, the last one being in the journal Ecological Complexity in 2007.
d) You attempt to malign Dr. Nir Shaviv because he is an astrophysicist. However, since solar activity clearly does influence climate, his degree is perfectly legitimate for a climatologist. Indeed, as you claimed previously, the definition of a working scientist is one that publishes in the field. Since his papers have been accepted in peer-reviewed climatology journals, he is a climatologist, by your very definition. In addition, while some have cast doubt on his ideas, he has replied to those doubts, showing the doubters are wrong. e) Once again, you contradict your own definition of a working scientist again when you try to libel Dr. Patterson. You say he “describes himself as a paleoclimatologist.” However, based on your own definition, you would have to describe him like that as well, since he publishes in the paleoclimatology literature. In addition, you claim that he is “tainted by” oil money. Once again, Dr. Mann is “tainted by” agenda-driven money as well, but that doesn’t seem to bother you. In addition, the link you give doesn’t indicate that ANY oil money went to him. It simply went to organizations for whom he has spoken or done some board work. I have spoken at many secular universities. Does that mean I am “tainted by” the contributors to those universities? Of course not. It is sad that you would sink so low in trying to malign someone with whom you disagree. f) Dr. Richard Lindzen has also received money from oil companies. However, that doesn’t indicate any more about him than the millions that Dr. Mann has received. You claim, “To be clear, a funding source does not in itself disqualify the merit of a publication. But when the slant of a paper and the agenda of a funding source happen to coincide so neatly, one tends to look askance at the conclusions that are drawn.” I could say the same thing about nearly every promoter of the human-caused-climate-change agenda. However, since I don’t engage in ad hominem attacks, I don’t do that. Instead, I address the actual data they produce. It is unfortunate that you won’t do the same. 5. The definition you give for a meteorologist shows specifically why they are quite relevant in the climate change debate. Indeed, the climate debate attempts to “forecast the earth’s atmospheric phenomena and/or how the atmosphere the earth and life on the planet.” Thus, meteorologists are part of the scientific community that studies this issue! Now, you try to obfuscate this with the issue of timescale, but there are long-term meteorologists as well as short-term climatologists. The fact is that both areas are intricately connected to climate, and both disciplines contain experts in climatology. You ask whether any of these world-renowned climatologists (who you attempted to libel) were left out of the 97% tally. I am sure they were. This wasn’t intentional, of course, but it was because of the bias in the selection method they employed. You ask, “Where do they draw the line?” They draw the line at peer-reviewed publications. Unfortunately, they didn’t do that. They drew the line at publications in the peer-reviewed journals that tend to promote the human-caused-climate-change agenda. That’s one of the many reasons the Cook et. al. paper is fundamentally flawed and does not belong in any serious discussion of climate change. I am sorry to be so aggressive in this reply, but when people libel excellent scientists simply because they don’t like the conclusions these scientists promote, it really, really bothers me. I agree with everything that you said, Dr. Wile, but try not to sound like you regard other people as unintelligent. I know you don’t, but if I were on the receiving end, and whether or I’m in the wrong, I might be more close-minded to your refutations. That would be counterproductive. I think scientific discussions are more effective when the arguments are presented with humility, being careful about the way things are worded. I understand you have a lot of passion for science, but I recommend that you try to make those who you disagree with feel like your friend, rather than opponent. So how do we stop volcanos from erupting? @Don Hill, we need to remember that weather (fronts, storms, droughts, floods, etc.) is not the same as climate. Nor, according to my research, does volcanic CO2 emissions exceed human caused emissions. I applaud Dr Wiley for his thorough research and objective analysis. I agree with an opinion I heard at a seminar some time ago that we can’t significantly change the CO2 content in the atmosphere and expect it to have no effect. Common sense suggests we should be reducing CO2 emissions as a precaution while waiting for definitive data. 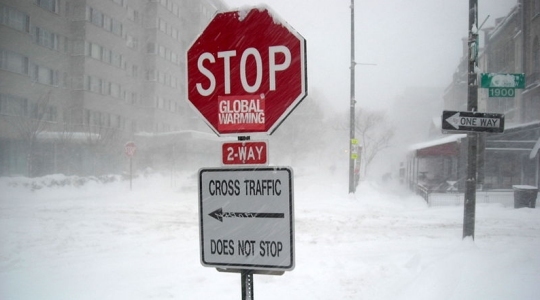 We don’t want to discover too late that anthropogenic global warming was correct after all. Me? I’m just a structural engineer with a smattering of common sense. You are correct, Chris. Don might be right that volcanoes emit more total pollutants than automobiles. I have no idea. However, when it comes to just carbon dioxide, human activity dwarfs the emission of volcanoes. The problem with the “act now despite the fact that we don’t really know” approach is that acting now kills people. When you increase the price of energy, people die. I agree that we should do all we can to move from a fossil-fuel-based economy, but we need to do so without killing people. Thus, we should only move to fossil fuel alternatives when they are not significantly more expensive than the fossil fuels. Dear Dr. Wile, independently of climate change, the effects of industrial and all kinds of pollution on the health of millions of human beings (and animals, and plants) IS objective and undeniable, isn’t it? And investing in clean energies and cleaning up the messes would be for the best of humanity, wouldn’t you say? I absolutely agree, Ana. However, as I said to Chris, this has to be done without killing people. When you increase the cost of energy, people die. Thus, we should definitely move to alternate energy sources, but only when they are not significantly more expensive than fossil fuels (or when it becomes clear that fossil fuel use will kill more people than increased energy prices). Yes, well-fed, well-housed experts forget little difficulties, such as the tens of thousands of elderly people who die every year in the UK as a result of expensive fuel. They face a choice between “heating or eating”, which is so well known that it has become a tag phrase. Of course, the wizened elderly don’t make good advertising copy, so they are easily overlooked and don’t appear in the charity top ten of favourite causes. I am very interested in this subject. I have read that Germany and Denmark, for example, are well on the way to moving into renewable and cleaner energy sources. Do you know if it is true, and if energy is becoming more expensive in those countries, and whether it is affecting the price and the quality of life of the elderly or the poor? I have also read that a lot of money goes right now in many countries to subsidize the oil industry, for example. If the same kind of money would proportionately go to the cleaner energies instead, wouldn’t the price differences revert? Thank you again for your attention to these questions. Germany is probably the leader in renewable energy right now, and their costs are going up considerably. I am not aware of any studies that have focused on the effects the increased cost have had on the poor. However, the studies have been done in the UK, and they show a direct relationship between death in the elderly and cost of energy. All industries get subsidized to one extent or another. If nothing else, the tax breaks offered to a company to get them to relocate to a specific area could be considered subsidies. However, it seems to me that per gigawatt, “green” energy gets a lot more subsidies and still ends up being more expensive. Once again, in the UK, those subsidies have been cut because they are thought to be too expensive for the taxpayers. Unfortunately, Henry, most of the “evidence” given on that page isn’t evidence at all. Consider, for example, the first four items. In the first one, they claim that humans are the dominant forcing in climate right now. Of course, they present no evidence to back that up, because there is no evidence for that ridiculous statement. In fact, the climate models that assume humans are the dominant forcing are in dramatic disagreement with the data. Thus, right now, the evidence is that humans are NOT the dominant forcing. In item #2, the site does what most agenda-oriented sites do. It ignores the science and simply puts up a deceptive graphic that is designed to make people think their argument is legitimate. In the graphic, they show solar activity versus temperature and claim that for the past 35 years, the trends have been opposite. However, as anyone with a passing understanding of the mechanisms of global warming understands, the total solar activity doesn’t impact global temperatures. However, the activity at SPECIFIC WAVELENGTHS does. When you look at those specific wavelengths, you see that they have, indeed, increased in intensity in recent years. So in the end, while total solar activity has decreased, the activity that influences global temperatures has, in fact, increased. In addition, the site doesn’t mention the impressive work of the CLOUD research group, that shows another link between climate and the sun. In item #3, they try to imply that most of the changes due to climate change will confer few (or no) benefits, but lots of negative consequences. This, however, has no basis in the data. The fact is that many benefits of global warming have been documented in the scientific literature (fewer winter deaths, lower energy costs, better agricultural yields, fewer droughts, etc. ), as have many negative effects (higher sea levels, more extreme weather, shifts in ocean currents, etc.). The balance is completely unknown. Item #4, of course, is debunked by this very post. I could go on, but you should be able to get the idea. When a group pushes an agenda rather than examines the science, it isn’t helping the environment. It is just promoting ignorance. Another Evolutionary Prediction Falsified Yes, Earth Is Unique, But This Study Doesn’t Demonstrate That!